← "But I am le tired." Last night, as I was running about like a crazy woman, Mike Neir made the fatal mistake of asking me if he could do anything to help. “You could clean the kitchen.” He did, and he did a fabulous job – I wish I’d taken a before/after photo. 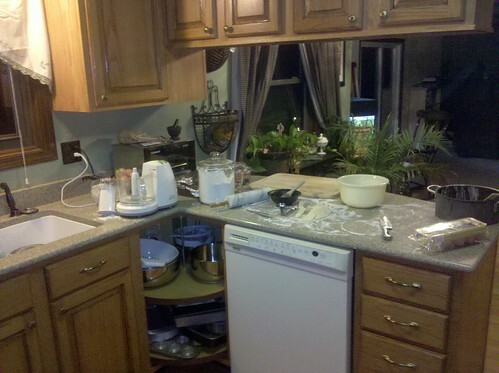 I’d decimated that kitchen making truffle sauce and a pecan pie for his extended family’s gathering today. I hope it was edible. I know the heartbreak of spending an hour or more cleaning the kitchen, only to have that work obliterated in less than 24 hours, so I gathered what energy I had left, put the dirty dishes into the sink and wiped down the counter. It’s all I’ve got left. The dishes can wait until Saturday, right? The mushroom pie is baked, after an epic struggle with the crust. I’ve mentioned before the mutual dislike and justified mistrust pie crusts and I have of each other, and tonight didn’t do either of us any favors. I hope it will be tasty enough so Mike’s family can forgive the half-assed lattice and random flutes. I used the food processor to cut the butter into the dough – why do I not always do this?! It took one eighth the time, and when I dumped it out of the bowl, I thought, “Huh. So that’s what ‘coarse meal’ looks like.” Pie crust recipes always reference “coarse meal,” as if one should know what that is. The phrase probably originates from the times when we ground our own flour, and has been passed down, recipe to recipe, as what pie crust dough is supposed to look like. In the modern day, I don’t think it has any meaning. I have pretty much everyone’s gifts in hastily-assembled gift bags, emphasis on “hastily;” if anyone looks at them closely, they’ll notice some of the French seams have raw edges peeking through to the outside. They aren’t even close to being square. But they’re reusable and greener, dammit. I need a shower, badly. A nap worse. Using the left-over mushrooms and pie crust, I made a mushroom quiche-type thing for my dinner. Why? Because I had extra pie crust. I hope you are all close to having everything accomplished, friends, and will have a peaceful night and tomorrow. Safe travels to those who must travel. I completely agree about pie crust!! Merry Christmas! I love the wrapping fabric idea….I just used the standard rolls at the dollar store. It looks like a really wonderful day. I love all the stuff you made in this post! Awesome PEARness! Thanks Gabrielle! Sorry you were getting caught in the comment spam filter, not sure what happened there! trying to leave a comment!